The chief engineer of Ethiopia's most ambitious project was shot dead in Addis Ababa. The project had raised tensions with Ethiopia's neighbors, who have feared that their access to the Nile River would be disrupted. 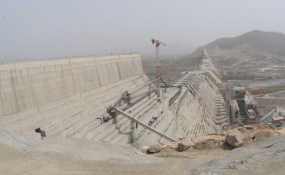 The chief of the controversial Grand Renaissance Dam project on the Nile River, a centerpiece of Ethiopia's push to become Africa's biggest power exporter, was found dead in Addis Ababa on Thursday, police confirmed. Simegnew Bekele's body was found inside a Toyota Land Cruiser, parked near a busy road in Addis Ababa's main public square, which is frequented by thousands of people daily. "We have confirmed that engineer Simegnew Bekele was shot dead," Zeynu Jemal, head of Ethiopia's Federal Police Commission, told reporters. "He had a bullet wound behind his right ear," Zeynu said, adding a Colt pistol was found inside the car. Images circulated on social media showing a gold Toyota SUV with a shattered rear passenger window, surrounded by police officers. Witnesses in the crowd said they believed Simegnew had been murdered, but authorities have not confirmed any details nor speculated about a possible motive. Asked if the gun belonged to the victim, Zeynu said that it "has not been confirmed." Prime Minister Abiy Ahmed reacted to the news, saying he was "saddened and utterly shocked" by the engineer's death. As project manager and main driver of the project, Simegnew Bekele was the public face of the Grand Ethiopian Renaissance Dam. The $4-billion (3.2-billion-euro) project had led to tensions between Ethiopia and its neighbors who share the vital resource. In particular, Egypt had raised the alarm over the dam's reservoir and whether its construction would disrupt the flow of water downstream. These were fears that Semegnew had downplayed in the past. In June, the dispute appeared to be headed for peaceful resolution, when the leaders of Egypt and Ethiopia met in a summit to work out the differences over the dam. Ethiopian Prime Minister Abiy made a verbal pledge to "secure" Egypt's fair share of Nile during the summit. Construction began in 2011, and two of its 16 turbines are scheduled to start producing power in 2018, Ethiopian authorities announced earlier this year. The Grand Renaissance Dam will be Africa's largest once it is fully completed and it will produce some 6,000 megawatts, roughly equivalent to the energy generated by six large nuclear reactors.